Giving Up – Love. Life. Practice. She found that gift through Kiva, a website that gives out microloans to help people in underdeveloped countries develop businesses. It works, too – their repayment rate is well over 90%, but that’s not the point. The $100 that Heidi gave wouldn’t be missed if it wasn’t paid back, but the repercussions that little step-up she gave the woman in Cambodia was life-changing. That’s what Ms. Miller gave for Christmas that year: a hand up. And I have to say, I like that idea of gift-giving. You all know the story of the Widow’s mite, right? A rich benefactor makes a generous donation to the church, but it’s an amount he would barely miss. Meanwhile, the poor widow gives but a mite – but it’s more than half of her total wealth. Who gave more? It’s all about percentages. If you have a little, you may not feel you can do much – but that only depends on where you send the cash. Sent to Cambodia, the cost of a cheap camera can buy someone a life-sustaining cow with which they can improve their world. Or you can buy that cheap camera for your nephew, have him forget about it (who uses cameras these days when you have phones?) and the amount of money has had no positive impact at all. “But my kids like presents!” I hear people say. And it’s true, the pressure to give and consume at the holiday season is pretty strong. Leo over at Zen Habits has some interesting ideas about that, though. He first posted his “No New Gifts Holiday Challenge” and then followed it up with a post about his “Gift-Less Children.” Turns out that his holidays are going just fine without having to fight through shopping lines, etc. That’s been my experience as well. A few years back I found myself with barely enough cash to get any gifts for my kids, much less the possibility of getting it for my many extended family members. I found myself faced with the choice of going to a discount store and attempting to get a couple of dozen tawdry, cheap gifts…or something else. What my extended family members got was a small card, thanking them for their presence in my life and informing them that I’d made a donation, in their name, to OXFAM International. This is one of the most reputable aid organizations in the world. You don’t have to give a lot, but what you do give goes to good places, without a lot of the politics that are often involved in other aid organizations. However, it’s sometimes hard to make kids understand what it is they are giving. Which is why I like the idea of giving Up instead. Teach your kids about the Cambodian Cow, then turn them loose on a site like Kiva or Kickstarter. The latter is where people with great ideas try to find backers to get their dreams off the ground. 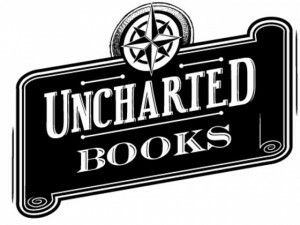 Places like Uncharted Books in Chicago, IL, who I helped back so they could raise $10,000 and get their store off the ground. Do you know how great it feels, at those times when I can barely afford to pay for a used book, to know that I am a part of the walls of this store? The kind of place I would love to wander for hours, and I helped build it up. How do you think your kids would feel if they could do that? Suddenly rather than playing a fantasy game, they are part of a very real game of life, helping others “level up” and being a real influence in the world around them. Be careful. The feeling is so good, it is likely to be habit forming. Seems to me that in a season that’s supposed to be about giving, the gift of Up – even a little – can be the most meaningful message of all, regardless of your beliefs. Thanks for the mention! Also, I just found out about a local Seattle startup called Vittana, which enables educational microloans. For amounts as low as $5 (I did $25), you can contribute to someone’s request for an education (for totals as low as $350!) And what is stunning is that that amount can easily triple or quadruple that girl’s earning potential FOR LIFE. Amazing! This year, I’ve been giving Vittana gift cards for birthdays and encouraging people to do the same for my birthday. Yeah, I’m materialistic and still really want an iPad… but microloans do keep giving in a way that the shiniest electronics don’t. Yeah, as a father of four beautiful girls, this really speaks to me. I had the impression it was for local Seattle only, but I see on the site that it’s worldwide, and also for males and females. I love the fact that as our politicians seem to defund education, organizations like this are popping up to do it anyway. Thanks for the tip!